The Knights of the Order, bravely controlling the galaxy. Suddenly, they get a report of an illegal mining operation in Kino. 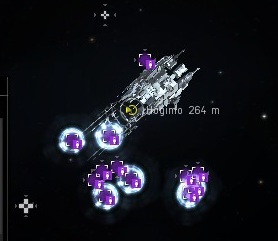 The Knights valiantly give their lives to destroy several mining vessels belonging to none other than Mine Teck, the strawberry prince of the rebellion--most famous for this TeamSpeak recording. 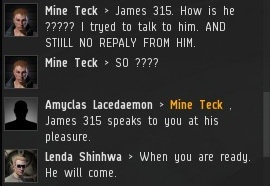 Mine Teck returned to Kamio, looking for answers. 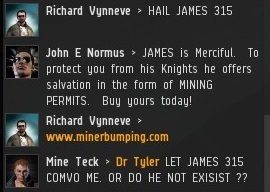 Despite urgent appeals from Agents of the New Order, Mine Teck would not put his faith in James 315, whom he had never seen. Mine Teck only believes in what he can see with his own eyes. 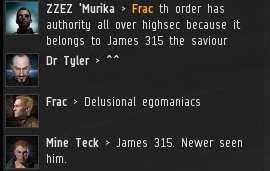 He began to suspect that the Saviour of Highsec was an elaborate fiction. Why else would people say his name instead of linking it? Without the Code to ground him, Mine Teck began drifting through a philosophical fog, grasping in vain for other ideologies. In the midst of an existential crisis, Mine Teck was vulnerable to the pernicious heresies being peddled by the resistance. He fell in with a bad crowd, rebels who aided in the poisoning of his mind and heart. Mine Teck no longer believed in anything or anyone. He was gripped by paranoia. He began to suspect even fellow rebels of being New Order Agents in disguise. 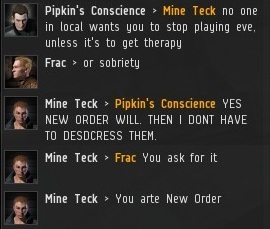 Mine Teck cut himself off from the only people who really cared about him, the Agents of the New Order. 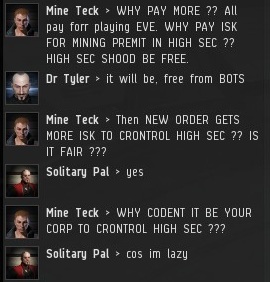 Mine Teck became radicalized, openly advocating the overthrow of highsec's rightful government. 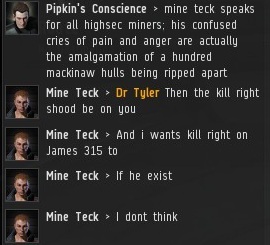 In this dark moment, Mine Teck became a cynic. He doubted the very existence of the Father of the New Order, despite the testimony of so many Agents all around him. Mine Teck's radical politics were animated by hatred and suspicion of others. As is so often the case, a scapegoat was found in the form of Goons. Mine Teck's so-called "friends" in the resistance indoctrinated him with anti-Goon beliefs; in his mind, the Goons were a shadowy cabal that sought to control everything. Still, the focus of his anger was James 315, even if he didn't believe in him. Mine Teck cast his eyes toward the heavens. 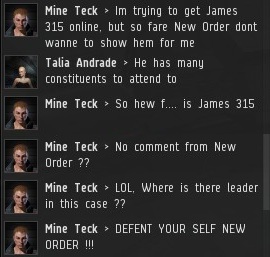 "Where is your James 315 now?" he cried. Finding no answers, Mine Teck gave himself fully to nihilism. 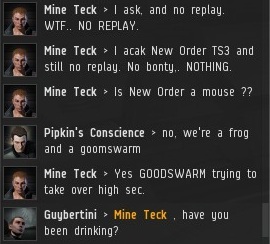 The distraught Mine Teck looked upon the chaos and disorder of highsec. 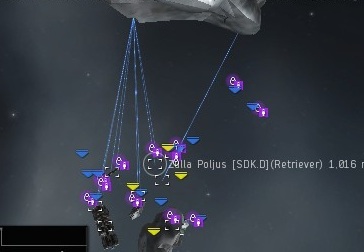 Surely if there were a Saviour of Highsec, he would not allow such things to occur? The Supreme Protector will speak to *whomever* He chooses, *whenever* He chooses. Amen. "James 315! Why have you forsake my strawberry?!?! 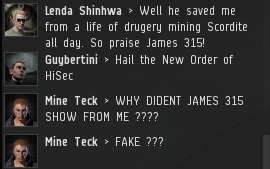 James 315 is real! I've seen him! I've flown in gank fleets with him! He was so charismatic and leaderful! "why has New Order not made me tiger ask??" I was there. I was there from shortly after the beginning. Does that make me an Apostle of James? And since i left, does that makes me Judas Iscariot ? Oh Lord 315, forgive me. Holy Antimatter brings hope and salvation to everyone, no matter wich language their souls cry then they freed from the darkness and solitude of AFK. 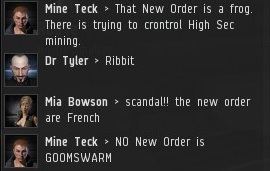 EVE is in English. It's like a country where English is the spoken language. You can't invoke ignorance of it to escape the law. 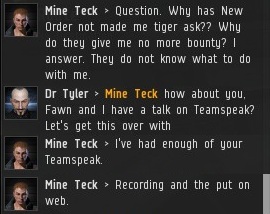 What the hell does "tiger ask" mean? Its amazing how you tend to take convos out of context...did you write the bible too?? 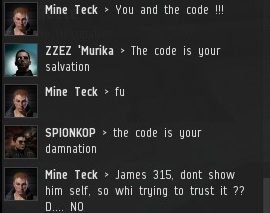 What is even more amazing is the fact that I sat in a belt mining with no permit for 3 hours and dared the new order to gank me. Instead, they ganked someone in a mackinaw who had a permit. Seems to me these actions only serve to dilute your cause. When you are man enough to gank me...I will be waiting.